These are ideal pens for drawing, illustrating, doodling and suitable for technical and artistic work. The unique Sakura Pigma ink will not bleed through paper and is indelible and lightfast, the ink will dry to a natural PH. Pack contains 6 fineliners and 1 brush pen, 005, 01, 02, 03, 05, 08 and the brush pen will give various width. All pens are black ink with an archival quality that is waterproof, fade and chemical resistant and will not smear or feather when dry. Bullet Journaling and Calligraphy are a popular use for these pens. Showing 3 of our total 6 reviews, with an average rating of 5 stars. 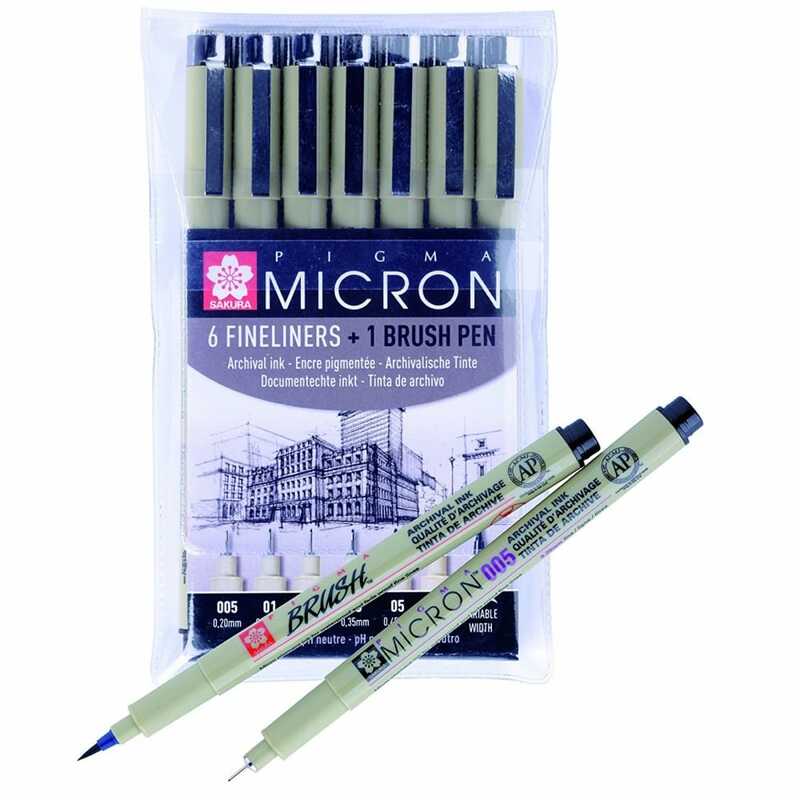 Read all 6 reviews for Sakura Pigma Micron Set of 6 Fineliners & 1 Brush Pen . This are used for drawings together with Copic markers. We are very happy with the product. Excellent, quality pens, in a lovely range of different sized nibs. Wanted a pack of Pigma Microns for ages, super happy that I found this pack with the extra brush pen for less than the cost of the 6 pack!